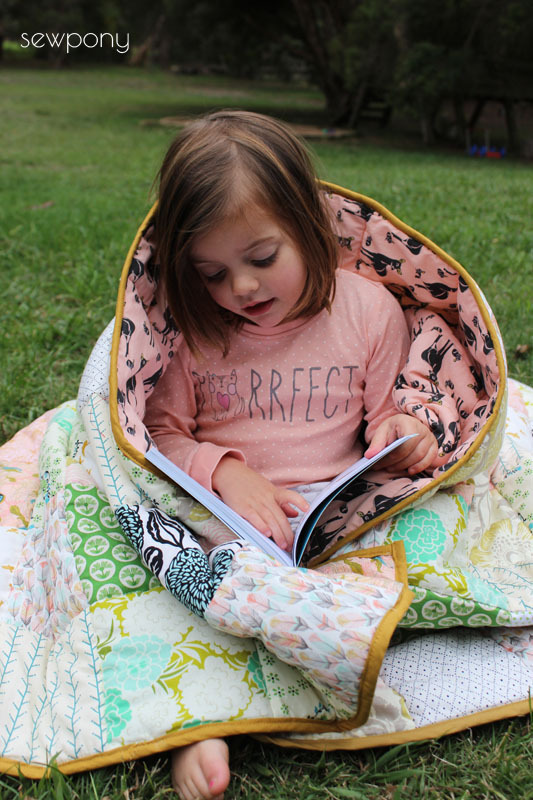 Last month Emily turned four last month and I made her a quilt. I bought the fabric for the quilt top around eight months ago and cut it around a month later then started sewing about a month after that! 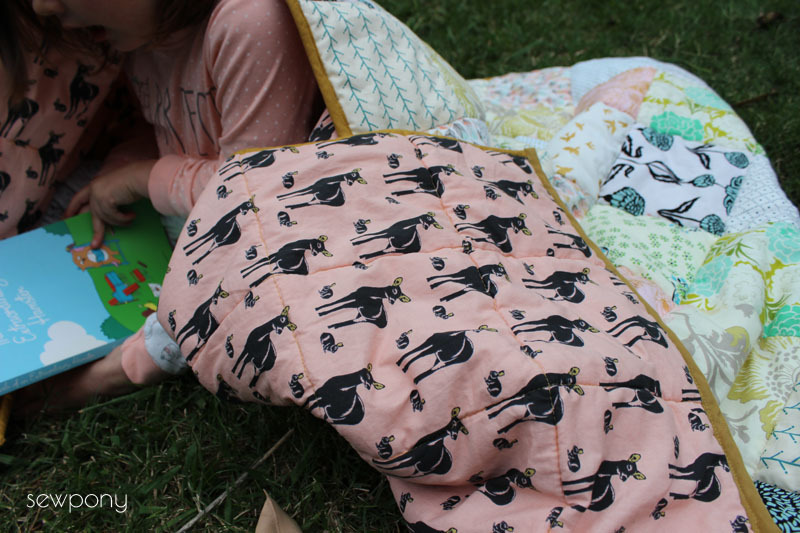 I actually changed my mind about three times over the fabrics and design of Emily's quilt and originally my husband and I picked these fabrics on line for a double quilt for us. But when it arrived and I started piecing it on the lounge room floor, Stefan realised he may have had a red wine too many when picking the fabrics as they were certainly feminine rather than neutral. So, a quilt for Emily was decided. I really love how all these fabrics complement each other. The main prints we were looking for were botanical greens with some teale, mustard and then some coral pink made its way into our basket! The fabrics are all from Hawthorne Threads. Unfortunately I have lost the invoice which contained all the fabric names, but I have searched a few of my favourites: the feathers fabric in the centre of the quilt is Feathers in horizon by Hawthorne Threads; the bold teale and navy fabric is Chrysanthemum in egg blue by Joel Dewberry; the gold birds (below) are Flight in White by Violet craft. Emily also received this little woolen grey bear. She has mustard suede ears, a cream wool felt face and some black button eyes. I did make her a little skirt from the feather print but it is somewhere in our house - most likely under a bed or in the dress up basket. I spent some time thinking about what might be a good backing fabric. 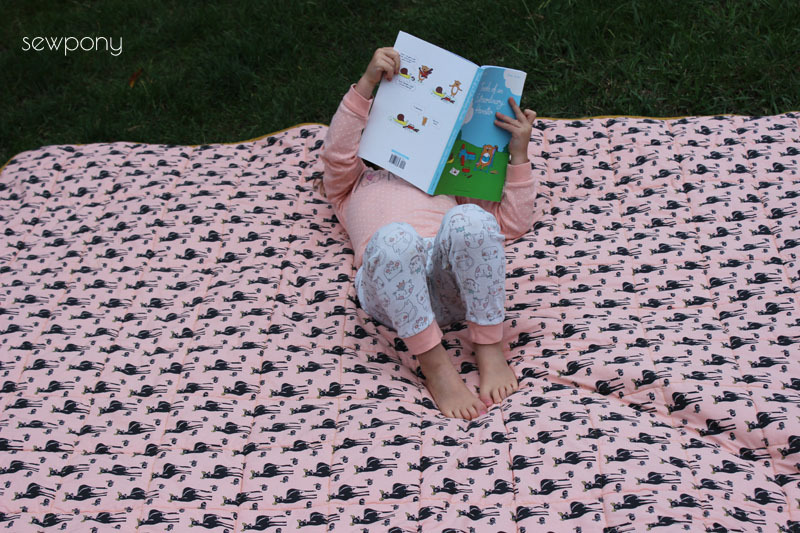 I was browsing through Maaidesign's web shop when I found Oh Deer in pink by the Belgian fabric brand - Soft Cactus. 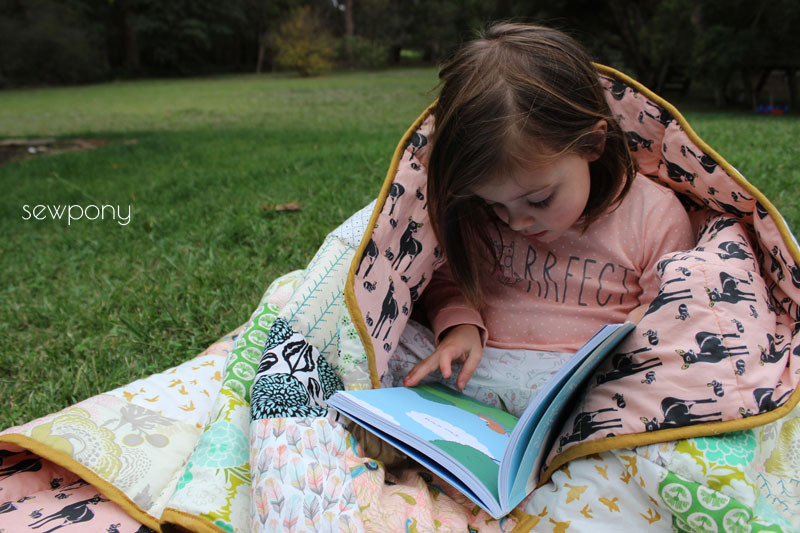 I am very pleased that a new blogging/sewing friend, Maaike is stocking this gorgeous fabric here in Australia! She also stocks Bambibluaw and Zonen 9 fabrics. I was slightly nervous ordering two metres of the fabric as I was not 100% sure the pink was the right tone to tie in with the quilt. But when it arrived in the mail, it could not have been more perfect!!! 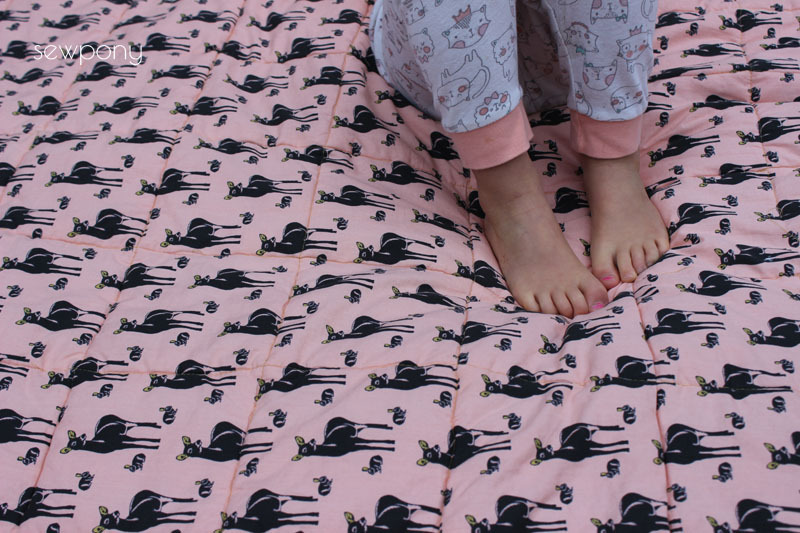 The coral pink is an exact match to the pinks on the quilt front and the deer and bunnies are a lovely charcoal grey with mustard coloured ears! 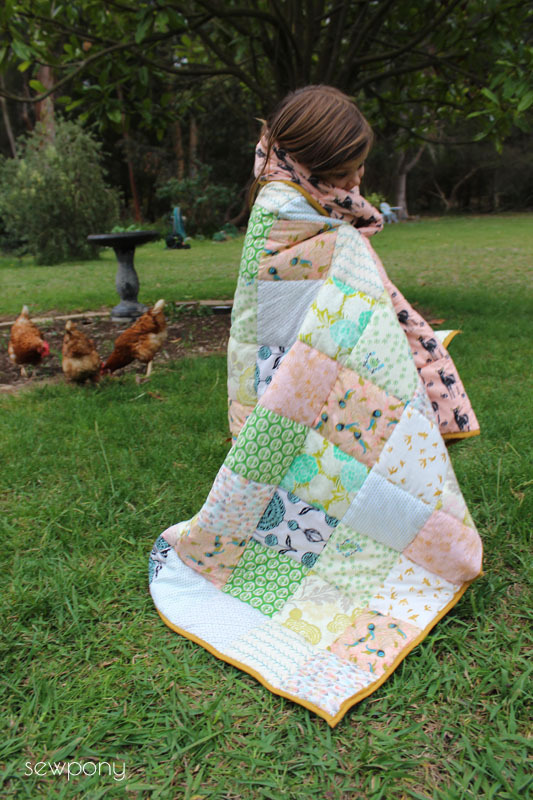 I took the quilt outside for some photos as the light in the girls' room was not really doing it justice at 4pm today. Emily happily picked up one of Isabella's books and got to work reading it aloud to me. I used my regular sewing machine for all of the sewing. I used a medium loft batting and used my walking foot for the quilting - mustard cotton on the bobbin and cream on the top. I simply quilted through all of the lines of the quilt top. The quilt binding is a plain mustard cotton I scraped together from pieces in my stash. The soft cactus backing is sooooo soft!!! I love soft cactus fabric so much! I am a big fan. It is 145cm wide which was great for the quilt as it spanned the width with some to spare. Two metres was just a little less than what I should have ordered but only I can notice that the quilt could do with being five centimetres longer. I just love doing this with a quilt!! Wrapped in love!! Wow Suz, I love it! The colors are so beautiful. And of course your daughter loves the deers :). 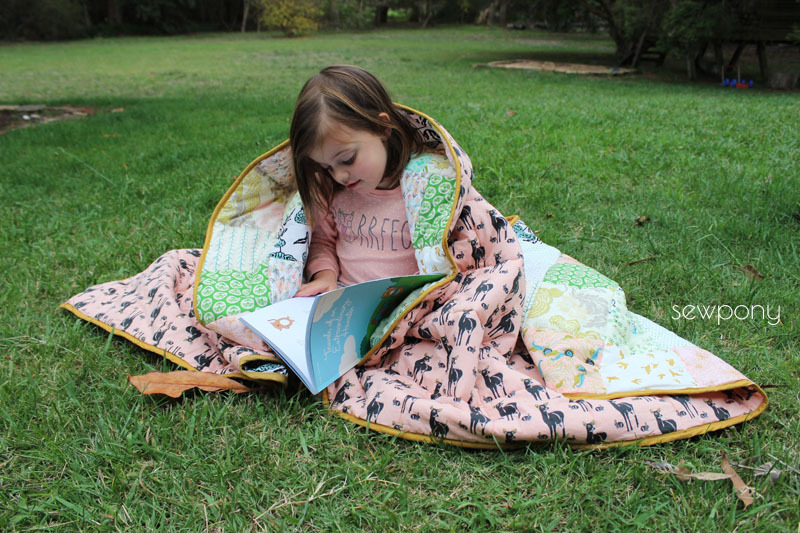 The quilt is so beautiful, the choice of fabrics is just lovely. I am currently finishing off my daughters quilt, just wondering why you use a walking foot to quilt layers together? Does it feed through better? Could you do it without? Thanks! Thank you Maaike! 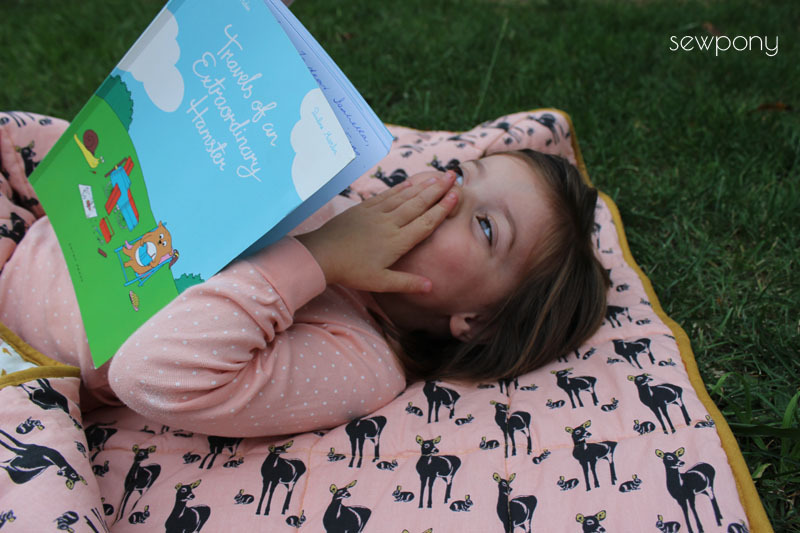 We love the deer fabric so much! Oh wat a shame you can't find it in its native country!